Heilind is now stocking Amphenol Industrial’s MIL-DTL-26482 Series I connectors – a high-density interconnect solution for rugged environments. Heilind Electronics, a leading global distributor of electronic components and authorized distributor for Amphenol Industrial, has expanded its selection of harsh environment interconnects with the manufacturer’s MIL-DTL-26482 Series I connectors. 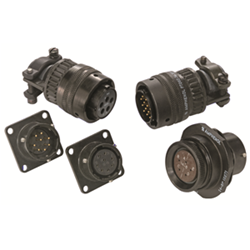 Available in both commercial off-the-shelf (COTS) and MIL-SPEC versions, 26482 Series I connectors feature quick-disconnect bayonet coupling and twice the number of contacts in half the size of a standard connector. The versatile 26482 I series is offered with either gold-plated solder or crimp contacts, including MIL-C-39029-approved styles. Additionally, the connectors support up to 23 A and wire gauges ranging from 24 to 12 AWG. One of the key features of 26482 Series I connectors is their rugged construction. These environmentally sealed connectors are built with lightweight aluminum alloy shells and operate in temperatures ranging from -67 to +257 degrees Fahrenheit. Liquid-tight assembly is enforced with a resilient neoprene insulator and integrated rear wire sealing grommet. Designed for both COTS and military-aerospace applications, MIL-DTL-26482 Series I connectors are widely used in instrumentation, monitoring equipment, machine tooling, factory automation, communications, geophysics, robotics, oil and mass transit. Visit Heilind's website for more information about Amphenol Industrial MIL-DTL-26482 Series I connectors.